The theme of my new block of the month series are snowflakes. So that they do not melt in summertime and I still have some time to prepare the new series it will start not until October 1, 2019. There will be twelve different snowflakes altogether. They measure 6 x 6 inch, additionally there will be one bonus block 15 x 15 inch size. Further information will be available shortly before the start of the series! My last block of the month series "Colorful Butterflies" is now complete. 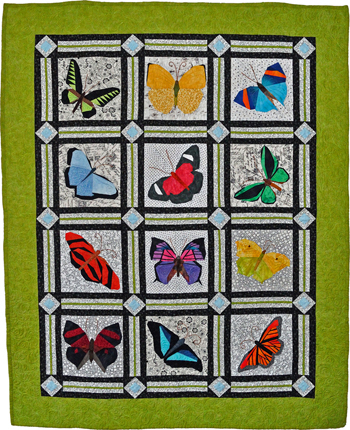 The butterfly quilt has moved to my summer page, the guest photos are now in the gallery, also found at summer quilts. You can now order the complete collection as well as single blocks in my patternshop. I hope you enjoyed sewing and collecting the blocks. Do you want to be informed about updates of my site? Please subscribe to my Yahoo-Group.